Many energy and industrial organisations in Europe would like to see the targets for renewable energy and energy efficiency abolished. They argue that the EU Emission Trading Scheme (ETS) should be the sole climate policy instrument for the energy sector and that having other targets, and subsidising renewables, interferes with the working of the ETS. Climate Commissioner Connie Hedegaard, however, does not agree. In an interview with our Brussels correspondent Sonja van Renssen, the Danish Climate Chief says the EU should retain targets for energy efficiency and renewable energy. Indeed, she favours EU-wide targets rather than the varying national targets that exist today. But she also admits that renewable energy has been subsidised too generously. And she calls on policymakers to avoid a “renationalisation” of energy policy. 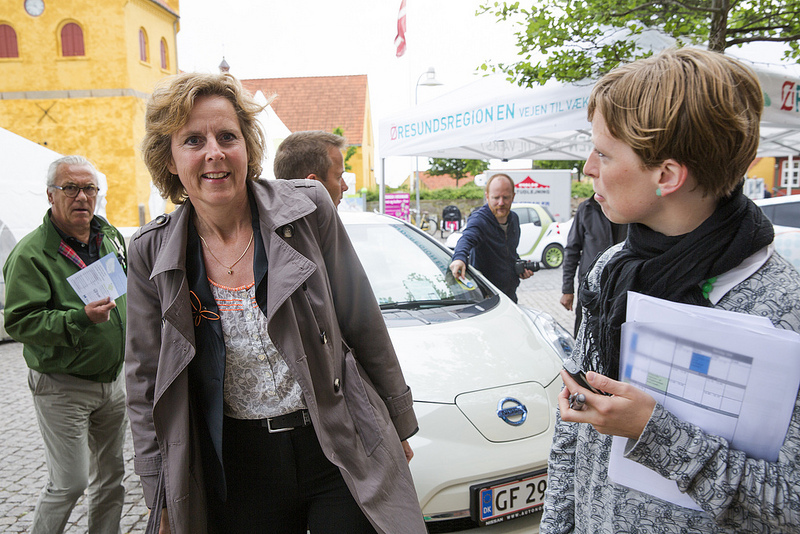 The European Commission will present its proposals for a 2030 climate and energy package on 22 January, Hedegaard says. They will subsequently be discussed by EU heads of state and government at a special climate summit on 20-21 March. This will follow on from a summit focused on competitiveness – which many industries claim EU climate policy is destroying – on 13-14 February. Hedegaard insists that investments in renewables and efficiency enhance, not damage, European competiveness and that a price on carbon can help stimulate the innovation Europe desperately needs. Q: What needs to be in a 2030 climate and energy package? A: What is important is that we continue a development where we have a more and more Europeanised energy policy. We should avoid renationalisation: one of the problems in Europe is that too much energy thinking stops at national borders. We also have to get the grids, infrastructure and interconnectors right to use our renewables in a more efficient way. We have to bring down our energy dependency and increase energy security. [And] of course we have to continue with an ambitious greenhouse gas reduction target […] that is also credible. When we talk about the whole world needing to do their fair share the same of course goes for Europe. Q: Some are calling for a single climate target for 2030, i.e. no renewables or efficiency targets. Would that suffice in your opinion? A: I think we must be careful that however we construct it – and that is what we are analysing now – there must still be a strong component of both efficiency and renewables in European climate policies [even if it does not necessarily have to be a copy-paste of what we did up to 2020]. Why? Also because if you were to ask the highest expertise in the field, the IEA [International Energy Agency], they would say to Europe ‘what you can do to bring down your energy bill and energy dependency is really to focus on efficiency and renewables’. If you ask investors, they are ready to invest. There are alternative financing models with pension funds and institutional investors standing ready with the capital. Q: By a “strong component” do you mean that we need targets of some sort at European level for renewables and efficiency? A: Yes, when you ask like that I think yes, that has served us well so far and my personal view is that that will also serve us well in the future. You can construct it in different ways [and] create more flexibility for member states [though] and that’s what we’re analysing right now. We all know that these are challenging times, that you must come up with policies that can actually be financed, that can the attract investments we need. We must [also] take care that if we have ambitious targets in one field, that for instance the way we expand the grid can follow suit because otherwise that will be one reason why our energy costs are higher than they should be. Q: If you support in principle the idea of having new targets for renewables and efficiency as well as a greenhouse gas target, can we ensure better coherence among them? A: That’s why I said it does not have to be a copy-paste exercise [of what we have so far]: there are many ways of addressing these kinds of things and many of our member states are already doing a lot. It’s right that we need to calibrate the interaction between the targets and the link to the EU ETS; that is of course part of this exercise. We also need to reflect about how in the future after 2020 we subsidise renewables. There has been a tendency in some areas towards overcompensation. That has made it more expensive than it should have been. We want to help immature technologies make it to the market but mature technologies should of course not be subsidised forever after. That was never the plan, even for those of us that think renewables are extremely important in the energy mix of Europe. Q: In terms of how these instruments sit alongside one another, do you still see the EU ETS as the primary instrument, or could we consider for example leading with a binding energy efficiency target and emission reductions flow from that? A: I still think pricing is essential. And that the ETS is extremely important. There could be other ways to get the pricing right but there you would see a patchwork of 28 different ways of doing things. I think it’s very much in the interest also of European business, that you have a European approach and that is where the strength of the ETS is. Of course, there were challenges when we had this very severe economic crisis – if not, it would have been the only place in the financial arena where you did not see problems – so we have to make some adjustments but basically I think putting a price on carbon is the way we should go. I think it’s no coincidence that China is now pursuing that, as are Korea, New Zealand and California: many, many economies are coming to the conclusion that if you want to do cost-efficient climate policy, an ETS of some kind is the way forward. Q: How do you intend to fix the ETS? There’s been a lot of talk about some kind of a supply-side mechanism. In the past however, the Commission has always maintained it does not want to take on the role of a central bank for carbon. Has that now changed? A: We are not talking about being the central bank of anything. But we are reflecting about how we can guard ourselves and the market from very, very big changes in economic development compared to forecasts. How can we avoid a repeat of the backloading exercise? I think many people will understand why it’s worth trying to avoid a repeat of that. Q: The big issue on the table right now is competitiveness. To what extent do you feel climate policy can be blamed for what many are calling the de-industrialisation of Europe? A: I must say that’s one area where there are I think too many myths floating around. If you really look at it, was there carbon leakage due to climate policies? Did that cause companies to move out? The answer when you analyse it, is no. Why? Because we had instruments in place in Europe so that the sectors that were very directly exposed to competition from outside got all or most of their allowances – their permissions to pollute – for free. It’s very important when we discuss the problem of energy cost, to analyse it correctly. Because if you do not get the diagnosis right there is a very big risk the cure will not be right either. One of the big reasons why we have higher energy costs in Europe is because some member states have chosen to put a tax on energy instead of on labour. We could also do better on energy infrastructure, grids and interconnectors, and we still have a gas price linked to oil prices – that might not be the wisest thing to continue. You need to get it right and that is why when we present this 2030 framework, it will be accompanied by an analysis of energy cost in Europe. I hope that can contribute to getting facts distilled from myths also on the competitiveness issue. Because if you look at which sectors actually managed to create more jobs during the crisis, the efficiency and renewables sectors are among them. Not too many sectors can say that. We know that Europe has a frontrunner position in some of these technologies for which demand is increasing at global level, so maybe we should also start to talk about the risk of low-carbon leakage. Q: Energy-intensive industries say that they also have a big role to play in Europe’s low-carbon economy (e.g. aluminium for making lighter cars) and they are still here thanks to the compensation they have received for the risk of carbon leakage. Can we expect such compensation to continue also beyond 2020? A: There will still be ways of addressing exposure if your competitors outside Europe do not have binding targets. So in that sense, yes, but we should not forget that if you have a price on carbon, it can also stimulate innovation and we need innovation in Europe. We should not stretch too much but industry will have to stand on the tips of its toes and that is not necessarily bad. By the way, one of the few parts of the next EU budget [from 2014-20] to increase is that for innovation, research and development. Thirty-five per cent of the €70bn [R&D budget] will be spent in a way to promote our climate and energy targets so there is help there if you want to be innovative. Q: Will that be complemented by something similar to the NER300 support [income from selling carbon allowances] that exists for carbon capture and storage (CCS) and renewables today? A: Yes, we have the NER300 and we are also thinking about whether we could have other programmes where some of the money that will come through the ETS could [be used to] stimulate innovation in industry. That’s one idea but I would still say look to the EU budget too. Q: Finally, what decisions – if any – need to be made by European leaders at their climate summit in March? How far should Europe go with continuing uncertainty over a global climate deal? A: I think it would be extremely unwise, also economically speaking, if Europe sat waiting for the rest of the world to deliver things without doing things ourselves. Why? Because you will have a hard time finding any region in the world more dependent on imported fossil fuels and for that matter imported resources. It’s in Europe’s own interest to pursue an intelligent policy where more resource and energy efficiency, climate policies, economic policy and competitiveness go hand in hand. When I talk about intelligent climate policy, it will be a policy that continues, as it has done until now, to create new sectors in Europe: a renewables sector, a waste handling sector and an energy efficiency sector where we managed even during the crisis years to create more jobs. In some of our member states green technologies already represent more than 10% of their combined exports. This is not just something that could theoretically be good if we do it right, it is good for Europe.